The VPN cloud hub provides secure communication between distributed data centers using a hub-and-spoke model with a VPC architecture. It enables connection to organizational data centers, whether on-premise or in the cloud, in order to function as part of a single, private network. These networks can use IPsec or TLS in hardware or software. Figure 1 – An example of a VPN cloud hub architecture. The VPN cloud hub architecture provides the flexibility to connect on-premise applications with hybrid deployment options. 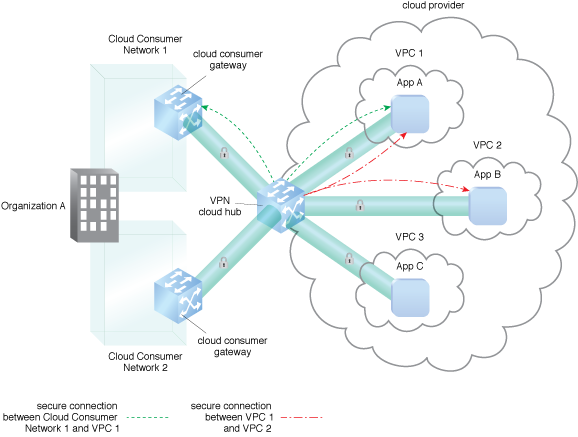 Figure 1 shows a VPN cloud hub connecting the organization’s resources that are on-premise and in two separate clouds. The VPN architecture depicted here is gateway-to-gateway.